A brief interlude this week, with some background info on the city. Future cities are, perhaps counter-intuitively, more isolated. This is in part due to their self sufficiency- free energy, and later the ability to transmutate practically any substance means there is no longer any use for trade relations. This is also an era of the greatest class divide in history, at least in this region, with people in rural areas living in primitive conditions with almost no technology or resources available, and city dwellers having intelligent machines taking care of their every whim, living in abundance. There is also a great deal of anarchy outside the cities as people fight over resources that really don’t need to be limited, if only the privileged city dwellers would share more tech. Non city dwellers are demonised and labelled ‘undesirables’, seen as sub-human; city dwellers are conditioned not to feel sympathetic towards their plight, and having never suffered such lack, can’t possibly understand the motives for the crimes they commit in order to survive. Ironically, suicide rates and depression are sky-rocketing among city dwellers; I suppose having your every need met with no challenges can make life a bit meaningless. 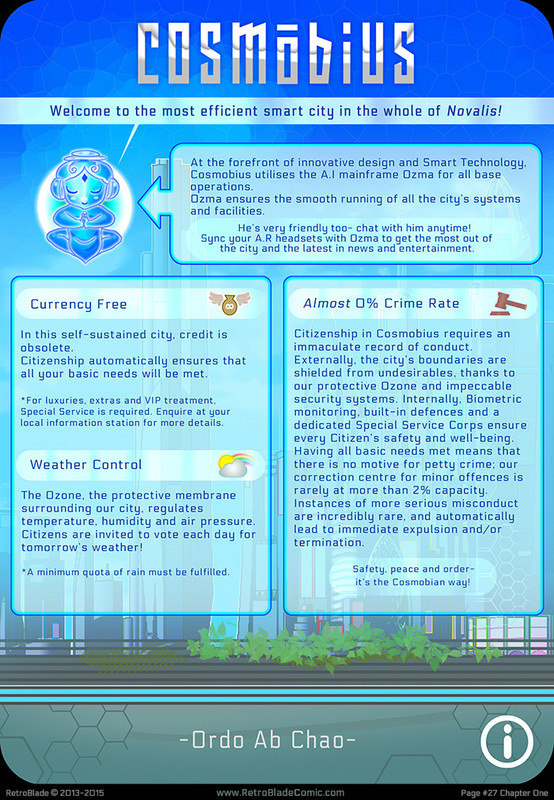 Fun fact- Ozma controls other cities too, not just Cosmobius.